Nice intention, sure. But that's no excuse for credulity. 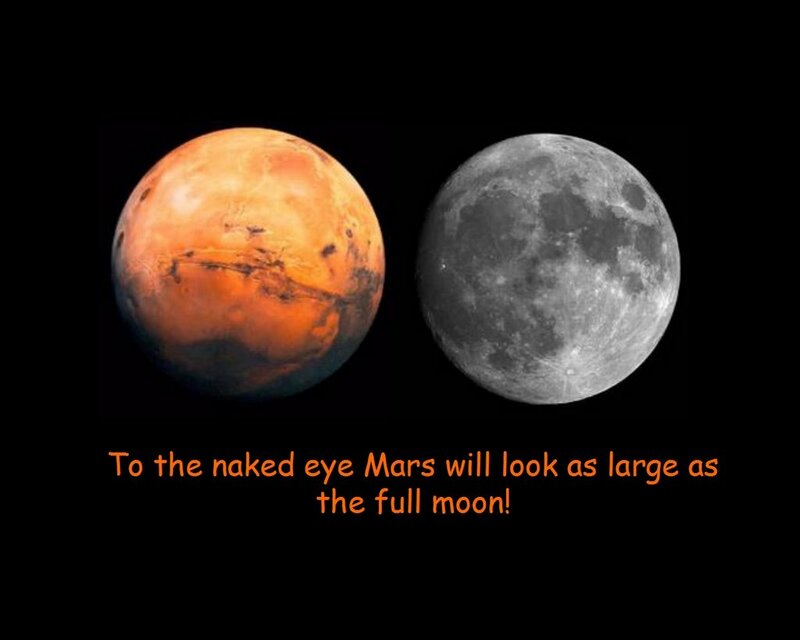 On August 27th … Mars will look as large as the full moon…. http://www.hoax-slayer.com/mars-earth-close.html, or this, http://www.abc.net.au/science/news/stories/s1446143.htm, or this, http://urbanlegends.about.com/library/bl_mars_encounter_2006.htm, or this, http://science.nasa.gov/headlines/y2005/07jul_marshoax.htm. Mars as big as the moon! Come on... you should feel somewhat embarrassed. Sorry if I've been somewhat supercilious and forthright, but chain emails [expletives deleted]. Rule of thumb - If it's a forwarded email, it's almost certainly crap and you should delete it immediately. Then send a vitriolic email to the person who sent it to you (as I am doing). They'll get the message that we all waste enough time downloading random spam as it is. We don't need people we know going out of their way to waste more of our time (and data usage) by sending us contemptible crap. Ps - I just saw that you got it from someone who is going to teach it! This scares me no end. There is enough ignorance and credulity in the world as it is. We don't need to teach people this; it comes naturally. Please do this right thing and set them straight. Reading the linked explanations above, it's possible to see how the email evolved into a hoax. Here's a good story about internet/email hoaxes. Tagged - Fallacy, Skepticism, Factoid Propagation.